ON MONDAY SAM AND DAVE DUG A HOLE BY THE APPLE TREE. "WHEN SHOULD WE STOP DIGGING?" ASKED SAM. "WE WON'T STOP UNTIL WE FIND SOMETHING SPECTACULAR," SAID DAVE. For a while it's excavation heaven for the two boys as Sam and Dave succumb to the urge all kids get now and then. Down and down goes their shaft, until they are quite a distance under the ground. Even their dog looks a little bored. "I THINK WE SHOULD DIG IN ANOTHER DIRECTION," SAID DAVE. Nothing spectacular appears. The cat looking down from ground level lies down for a bit of a nap. The two separate, digging obliquely off from their position. It's not a fortuitous decision, though, because they just miss a gigantic diamond by a scant spade's length. Sam and Dave get incredibly dirty. They run out of chocolate milk and cookies. Finally, they vote to take a rest and before they know it, both are snoozing. Their dog, however, is still on his mission, and he smells a bone just below. He starts digging. But just as he has the bone in his teeth, the bottom drops out of the hole, and dog, bone, and both boys are in free fall, down and down and down some more. Finally, they land on solid ground. Dazed, they look around. There's the house and the tree. They're back where they started. Or are they? 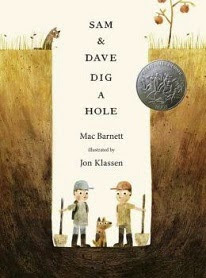 Good April Fool's Day fare, Mac Barnett's Sam and Dave Dig a Hole (Candlewick Press, 2014) was a 2015 Caldecott Honor Medal winner for the illustrations by Jon Klassen, who also won the Caldecott Medal for his This Is Not My Hat. and a Caldecott Honor Award for I Want My Hat Back. Clearly, Barnett and Klassen are a digging tale duo made in heaven, sharing as they do a penchant for wry wit and a less-is-more style. Barnett's narration is understated, leaving room for Klassen's ironic illustrations to get the laughs at the clueless boys' expense as they miss their something spectacular at every unfortunate turn. But the best is saved for last, in a tip of the hat to Lewis Carroll in which Barnett and Klassen leave it to the discriminating reader to detect that the parallel world they fall into is not exactly their own. "Part wry comedy of errors, part Twilight Zone, this book feels timeless," says Huffington Post's reviewer.